The Thermo NanoDrop 3300 Fluorospectrometer brings you a diverse range of measurements in a compact, powerful instrument that can sit right at your workstation. This fluorescent spectrometer can handle routine measurements such as RiboGreen, PicoGreen, and GFP to more advanced nanoparticle and FRET analysis providing you with both spectral and quantitative data in as little as 10 seconds. This spectrometer is ideal for low sample volumes, using a scant 1.0 µl allowing you to keep more samples for other test and applications. Samples in this fluorospectrometer can be pipetted directly onto the optical measurement surface, and once the measurement cycle is completed, the surface simply is wiped clean. The Nanodrop 3300 also has a broad range of excitation wavelengths without the need for a monochromator or filters to swap out, letting users collect multiple emission profiles. This fluorospectrometer lowers the mass detection limit more than a whole order of magnitude and has many tools to eliminate guesswork, making it user friendly no matter your experience level. 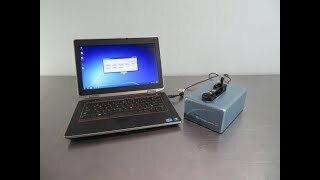 This compact spectrometer only needs power from a USB port from the connected PC and it’s ready to roll. This Thermo NanoDrop 3300 Fluorospectrometer has been thoroughly inspected and is performing beautifully. All of our lab equipment comes backed with our standard warranty. Should you have any questions, please don't hesitate to contact us.